Generally, I blog one Road Trip For Food per month. This month is an exception due to the fact that I had an incredibly delicious meal with some of the most special people in my life. It was, most definitely, blog worthy. Last week, Eric Kaufman graduated from the University of Central Florida. Eric is someone I have known and loved since he was 5 months old. I have loved watching Eric grow and mature through the years and when I was attending his graduation, it was as if I was watching one of my own kids walk across the stage. We all have special family moments that we treasure, but food is not always what brings these times to life. If you knew Eric and his family, you would understand why they work so well in this case. Perhaps it is our shared love of food that makes my heart melt when I think of Eric. He is the only college student I have ever known who sent pictures of his meals to his mom, who, in turn, very proudly shared them with me; and I am not referring to boxed macaroni and cheese. No sir/ma’am, we are talking about homemade Beet Ravioli, as a prime example. 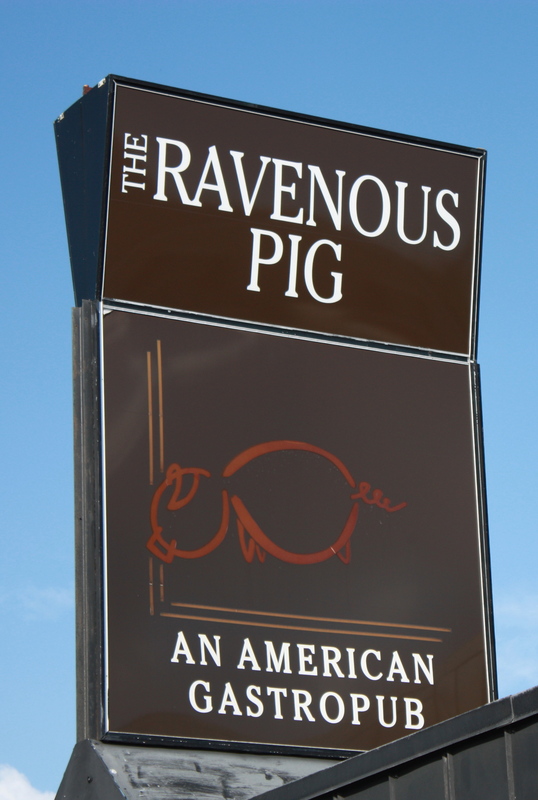 When I headed up to Orlando, we decided to meet at the restaurant, The Ravenous Pig, located in Winter Park. I had been to The Ravenous Pig once before and my mouth still waters thinking of that initial meal. The meal this time around was just as amazing. The Ravenous Pig’s menu is one of the most interesting around with each dish enticing our taste buds. The most difficult part of ordering was deciding which dishes we did not want to try. – “PB&J Semifreddo” – peanut butter-white chocolate semifreddo, raspberry sorbet and peanut brittle. For those of you not familiar with a semifreddo, the word is Italian and means “half cold.” When you see this on a menu, it is referring to a dessert that is chilled and/or partially frozen. – “Pig’s Tails” – warm cinnamon-sugar tossed fritters, chocolate espresso sauce. I was squealing with delight over these. – “Cheesecake” – cheesecake mousse, blueberry-ginger compote, homemade graham crackers. This had to be the most unique cheesecake presentation I have ever seen. Each component was placed on the plate, separately, and we had the pleasure of putting together our own cheesecake open faced ‘sandwich’. Some restaurants have a knack for putting together an eye-pleasing menu, but not quite delivering what is promised. The Ravenous Pig does just the opposite. Chef/Owners James and Julie Petrakis make the perfect team. James creates all the appetizers and main dishes, while Julie is working her magic on the desserts. I would definitely have gone to Eric’s graduation without the benefit of this delectable meal at The Ravenous Pig. Yet, true to the foodies, Eric and his family, we were all able to leave Orlando raving about the food in addition to absolutely gloating over the many wonderful accomplishments of a remarkable young man. In case you are wondering where Eric is heading next, I have great news to share. Eric will be going to Paris for a year to study, you guessed it, culinary arts. I have full confidence that when he returns, a restaurant as delicious as The Ravenous Pig will want Eric in its kitchen. I know I can’t wait for him to get back to see him at work in mine. Ravenous Pig is one of my favorite restaurants! Congratulations Eric!